books, he is also the author of the critically acclaimed dark urban fantasy, Faerie Tale. As a boy growing up in Southern California, Feist was an avid reader, devouring adventure stories at a great pace. Anthony Hope's Prisoner of Zenda, Robert Louis Stevenson's Kidnapped, Sir Walter Scot's Ivanhoe, Rafael Sabatini's Captain Blood, as well as historical novels by Thomas Costain, Mary Renault, and Samuel Shellenbarger were all favorites. 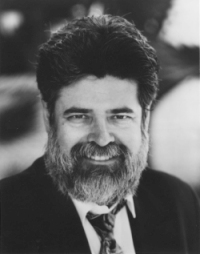 But it wasn't until later, during his college years at the University of California at San Diego, that he discovered the computer fantasy roleplaying games that were to have such a great influence on his career. It was during these gaming sessions that the fantasy world of Midkemia was born. After graduating from UCSD with a B.A. in Communication Arts with Honors, Feist wrote several humorous short stories after work and on weekends, mostly to share with friends. He then began working with an idea he had about a boy who would grow up to be a magician. Eventually this story turned into the first novel set in Midkemia, Magician. Magician was published by Doubleday in 1982, and the popular series was launched. He is known for his vivid characterizations, his inventive worldbuilding, and his breathtaking action scenes. Characters such as the powerful and wily magician Macros, Jimmie the Hand, the thief turned Duke, Mara, the girl who was called upon to rule an Empire, and the dashing Prince Arutha are just a few of his creations who sparkle with life and energy. Never one to rest on his laurels, Feist has also overseen several versions of the immensely popular computer game based on Midkemia. Like many bestselling authors, sometimes he longs to branch out into a totally different genre, such as police procedurals or westerns. But The RiftWar series shows no signs of ending any time soon, to the delight of his legions of fans around the world. He truly loves writing, which he says, "Is hard work; it's also the best job I've ever had." Feist lives in Rancho Santa Fe, California where he enjoys collecting films on DVD, fine wine, and the works of American illustrators. When he's not working, you might find him reading, surfing the Net, or rooting for the local pro football team, the San Diego Chargers. He spoke with us about his latest book, Krondor: The Assassins, challenges he's faced along the way to success, and gives some straight talk about making it as a novelist in today's market. How did you first create the world of Midkemia? Who was involved with the original Friday Nighters? Well, I didn't create the world of Midkemia, first of all. Midkemia is a collaborative undertaking, stated by Stephen Abrams and Jon Everson when they were graduate students at the University of California, San Diego. It began as a series of linked together gaming environments, and as people (such as myself) came aboard, it grew, developed, and evolved. The original Friday Nighters were actually the Thursday Nighters (we moved to Friday when the games started getting larger and more people showed up), who were part of the Triton Wargaming Society at UCSD. The "core" group as it were included Steve Abrams, Jon Everson and Anita Everson, Conan LaMotte, Steve Barret, Alan Springer, Rich Spahl, Robert Potter, Jeff and Lori Veltin, Ethan Munson, David Guinasso, and myself. One of the things about Midkemia which makes it a great narrative environment, is I don't have to be bothered with creating that environment; it's a virtual world, and I look at my writing as "historical novels about a place that doesn't exist." What led up to your first book being published? When your first book was published, did you have any idea how popular the RiftWar series would be? related game material, supplements for role playing and some rules, when I started "dabbling" at story telling. A few very bad amateur short stories about Midkemia preceded Magician, but in late 1977 I started playing with this story about a boy who would someday be a magician. By late 1978 the thing had taken on a life of its own and by 1979, it was finished. In 1980 it was picked up by Doubleday for publication as Magician. At the time I was out of work, due to a big tax revolt in California, and people such as myself in the heath/human services field were looking under rocks for work. So I became a writer. And if I told you I had a clue how popular the series would become, I'd be lying. I was just hoping to pay the rent while I was looking for a "real job." Guess I'm still looking. The magical system in Midkemia is quite interesting. How did you create it -- did it evolve before or after you decided on the main characters for Magician? Were there any characteristics that you were particularly trying to avoid? Again, that was part of the gaming world of Midkemia. Most of the credit or blame, if you will, comes from Jon Everson's insistence that there be a magic system that more realistically echoed what we think of on Earth as shamanistic magic, sympathetic magic, Voodoo, tribal magic, etc. Lots of emphasis on mood and attitude, compared to the more common "shoot from the hip" type of magic found in most other gaming systems. I incorporated that into the story of Pug. I wasn't trying to avoid anything, as you can see, but rather was trying to touch upon one of the central properties of the world of Midkemia which sets it apart from other fantasy worlds, i.e. magic comes in different "flavors." I've carried that farther in later books, especially with Nakor, who contends "there is no magic." The Empire series is also different in the fact that it tells the story of the world on the other side of the Rift, and in that it tells the story of a female protagonist, Mara. How did it feel to be writing from a female perspective most of the time? having been a teenage girl, I felt someone inadequate to write one in convincing fashion. I knew I wanted the protagonist to be a young woman, and I can't even tell you why. It just felt right. But, as such things occasionally happen, I had the idea for the beginning of the story and that was about it. The start of the Empire series is loosely based on the manner in which Alfred The Great became King of Anglia. He was just a few minutes away from being made a monk when the Chancellor of England showed up to tell him his brother Ethelred was dying and Alfred was about to be the new king. I loved that notion, the reluctant monarch who turns out to be the best in history -- he is the only King of England to be called "the Great" -- and thought it was a likely jumping off point for the Empire series. Which, by the way, was originally going to be a single book. Like so many other things in life, it got out of hand. Sometimes it seems as if the women heroines are a bit neglected in classic fantasy tales. Certainly, other than Galadriel, they played a very small role in Lord of the Rings. In the Empire series, the heroine is complex and believable -- how did you create the character of Mara? Were there any traits you were specifically trying to avoid? Yes. We wanted to avoid two clichés of fantasy; the wicked witch who manipulates men into doing her evil deeds (though Mara certainly knows how to manipulate when needs be) and the "She Devil" i.e. "chicks in chain mail" as Esther Freiesner, Judy Tarr, and Susan Schawartz once dubbed them. One Xena is more than enough, thank you. We wanted Mara to be competent, smart, canny, ruthless when needed, loving, and complex. Her motives had to be clear and she had to do things against her nature. We needed her to be nasty when needed without turning the reader against her. She was a tough character to write, but in the end, a wonderful character to write. What did you find most challenging about team writing with Janny Wurts when you wrote the Empire series? Mostly just keeping up with Janny. She tends to write far longer each day than I do and is a bundle of amazing energy. We had our arguments, too, but eventually we found compromises that ended up being better than what either one of us wanted to do. What do you like most about team writing? How does it work on a practical basis? What I like the very best is the opportunity to peek into the writing process of another writer, to see how she approaches the tasks that I would do a certain way, and to learn from that. On a practical basis, it creates more work than doing it alone, and that's often a source of irritation. Both writers do 100% of the work, but you end up throwing half of what you've put on the page away, in a sense, because someone else is rewriting it. One of the many things that sets the world of Midkemia apart from many other authors' fantasy worlds is the fact that Midkemia's cultures are very different from one another: e.g., someone from the Tsurianni Empire sounds and acts very different from someone from Krondor, for example. It's not a homogenized world in any way. How did you approach this issue when you wrote the series? Was this an important issue to you? "I'm always astonished at youngsters who say to me, 'I've been trying to get this story started for a few weeks, and I just can't get it right.' Weeks? Ya, like you can play Chopin after practicing a few weeks on the piano. I don't know why people think you get to be a writer without practice. So, young writers: write!" contrast the Empire of Great Kesh with the Kingdom, they have a couple of things in common. Both were states made up of conquered nations. The original "Pure Bloods" of Kesh and the inhabitants of the Isle of Rillanon were Imperialists, and they set out to broaden their sphere of power. So the cultures within each state are varied, more so in Kesh than in the Kingdom, but there are differences within each. I approach it on two levels, the first being my own political understanding of what I need dramatically, and the second being a cosmetic level where I can give the reader a feeling for what these people are like in a brief capsule. For example, I draw upon Earth cultures to provide the texture, so that if I say, people from Rodez are "Spanish-like" or people from Bas-Tyra are "French-like" that conjures a quick recognition, albeit a little stereotypical. Isalani in Kesh is obviously very Chinese, while the Pure Bloods are a blend of Egyptians and Parthians. And yes it was a very important issue to me, as I get very tired of science fiction and fantasy where everyone dresses the same, talks the same, has the same culture, etc. You can walk a dozen blocks in several major cities in the United States and hear a dozen languages, accents, see different fashion, etc. So why should all the citizens of Upper Poomba wear red, be white, speak with an Italian accent, and be fantastic swordsmen? Boring. Let's turn to the latest books in the Midkemia series, the Krondor books. Krondor the Betrayal and Krondor: the Assassins are based on the popular games set in the Midkemia universe. What were the greatest challenges in writing these books? The greatest challenge in these books is attempting to capture the essential story line of the game upon which the book is based, yet not devolve into doing a "play by play" narrative of the game. There are just too many difference between the written book and computer game on a perceptual level to make for an easy translation. So, many things that make a game a good game are terrible reading. Krondor the Betrayal was especially difficult because it was the first I tried to "translate" and because the story was almost entirely someone else's. Assassins was a bridging novel, but entirely originally with me, and as a result felt more like a traditional "hack and slash" adventure fantasy. I'm just now starting into Tear of the Gods, and don't have a feel yet for how much work I've got ahead of me. Can you give us a sneak preview of Tear of the Gods? Basically, Sidi, a character you first meet in Assassins is attempting to steal the Tear of the Gods, the single most precious artifact in the world, from the Temple of Ishap. The raid goes awry and the Tear is lost at sea. James, William, and Jazhara, Arutha's new court mage, must get to it before the minions of evil do. How did you first get interested in Computer Fantasy Role Playing Games? Personally, the first time I played Scott Adam's "Adventure" on the computer at UCSD. It was the one he did before he did "Zork." Very primitive, mostly just running from place to place, getting goodies you needed to get to other places to get other goodies, until at last you get to the other side. But the games that came after, Wizardy and others, got me hooked. Professionally, I got interested when Sierra On-Line called my agent and offered me money to write a game. I didn't write it, but I did license out the world and consult. What changes in the gaming industry have you noticed since you first got involved in the industry? Mostly in the area of technology. Brighter, bigger, faster, meaner, louder, sexier seems to be the mantra of the gaming industry. I find, other than that, it's changed very little. There's still a very small market relative to other mass media. If you look closely at the numbers, you realize that getting 250-300 thousand units out is considered OK, but there are millions more computers out there than ten years ago. Also, the paradigm of gaming hasn't changed much. You've still got Adventure games, and Fantasy Role Playing, and Shooters, and simulations, etc. Most people in the game industry really aren't very innovative, and when they talk about "new technology" usually they're talking "better multi-player over the Internet," or linking your desktop to their website, not about any significant changes in the guts of the game design itself. If you were forced to become one of your own characters in Midkemia for a year, who would you be and when? "Forced?" Well, I'd rather be none of them, as there are no flush toilets or antibiotics in Midkemia. I'd probably be King Lyam for a year, because as Amos observed, "It's better to be a captain than a deckhand." Good and evil are recurring themes in your books. Do you find the evil or the good characters more fun to write? Why? Good and evil are axiomatic to fantasy, though it can be argued, as Michael Moorecock does, that this is merely interpretation. I find characters difficult to cast as "good" or "evil," rather letting their actions speak for them. Hitler was the hero of his own life, and he never looked in the mirror and said, "I'm going to be evil today." He thought he had some really good ideas and never had a clue why so many other people around the world objected. So with that in mind, I find characters to be fun irrespective of their "good" or "evil" inclinations. I use a computer; just got a nifty Mac G4 which does lots of other fancy things besides writing. Anyway, I tend to write in the morning. I tend to write a little every day unless I'm traveling or have some other personal issues that keep me from doing it. Are there any other genres other than fantasy in which you'd like to write? Sure. Science fiction. And I will. I would love to do an "Elmore Leonard" type book, someday, with lots of quirky characters doing dumb things and keeping it interesting. Maybe a western some day. How much do you interact with your fans on the Internet and at signings? How does fan interaction affect your work? I interact fairly regularly on the Feist Fans Mailing List (out of Cornell University). I don't have time to answer a lot of fan mail, so this gives me a place to post answers to questions that several hundred people at a time can read. As far as the interaction impacting the work, very little. For every reader who loves something I did, there's another one who hated it, so who do I write for? The only answer that makes sense to me after doing this for twenty years is myself. Too many to mention. I have over a thousand laser discs, DVD's, and video tapes. In general, I love the great directors, starting with John Ford, Howard Hawks, William Wyler, Akira Kurosawa, Vittorio de Sica, Frederico Felline, and many others, including Spielberg and Turantino. I love screwball comedies, from His Gal Friday to The Secret of My Success, and sappy romances. I love history, action, and adventure films. Mostly, I just love watching films. What do you think about the WWF's plans to launch a new football league? I think they have a lot of credibility issues. If they're successful, they'll probably put the Canadian Football League out of business, as well as lowering the level of play in NFL Europe and the AFL. Convincing people they want to watch more football after the Super Bowl is going to be tough. As a father, are you concerned about the effect of violence in games, films and tv upon today's teens? "For every reader who loves something I did, there's another one who hated it, so who do I write for? The only answer that makes sense to me after doing this for twenty years is myself." By the teen years, it's too late. If parents have abandoned their children to the one-eyed baby sitter, their peer group, and media, they have no one to blame but themselves. There are lots of really neat kids out there who aren't smoking dope, aren't shooting up high schools, aren't getting pregnant, aren't stealing cars. They're volunteering to help the handicapped, the elderly, cleaning up parks, going to college, getting into the work force, and they're already solid citizens. Anyone who looks at screwed up kids and doesn't look at the parents first, the extended family next, the schools and community next, before looking at the media, just doesn't get it. What other projects are waiting in the wings for you? I've heard that Conclave of Shadows will be the next Midkemia story. Two, actually. Conclave is the next solo series, but I'm also doing a series called "Tales of the Riftwar" with three other writers, Bill Forschten, Joel Rosenberg, and Steve Stirling. They'll overlap in terms of publishing schedule. What are your pet peeves in fantasy stories? Bad writing. Look, it's not what you do, it's how you do it. "I got this story about a guy who went on a quest. . . " Most of the population would tell it that way. But Homer didn't. Tolkein didn't. I didn't. That's why were the story tellers and most of the population isn't. Have you ever faced writer's block? How do you deal with it? I don't believe in it. I believe there are times you can't write because of other issues in your life: death, divorce, marriage, buying a house, tax audits, etc. But if you sit and look at the screen and can't think what to write, that's your subconscious telling you there is something else you need to do first, then you get to write. Sometimes it's hard to figure out what that other things is, but once you take care of it, you get back to writing. Unfortunately, I've known writers who've taken years to figure out what that other things was. What is your advice to the aspiring fantasy writer? Write. I'm always astonished at youngsters who say to me, "I've been trying to get this story started for a few weeks, and I just can't get it right." Weeks? Ya, like you can play Chopin after practicing a few weeks on the piano. Or you can paint like Winslow Homer after taking a couple of days of art class. Or sing like Pavoratti because you sound good in the shower. I don't know why people think you get to be a writer without practice. So, young writers: write!